When Ford launched the Figo, the small car segment was burgeoning and manufacturers were trying hard to catch the buyers' attention. The Figo brought in fresh design, good interior space, impressive features and an efficient TDCi diesel motor along with a petrol unit. All of this and a killer price tag made the Figo an instant hit with the masses. Motoring journos too showered praises on the Figo for its ride and handling characteristics. The old car came with a 1.2-litre Duratec petrol engine that unfortunately did not offer good performance and neither did it return good fuel economy. The 1.4-litre Duratorq diesel though, was a gem. It offered decent performance and at the same time offered great fuel efficiency. The diesel Figo, hence, was the perfect choice for many buyers and it still occupies the lion's share of the Figo sales chart. 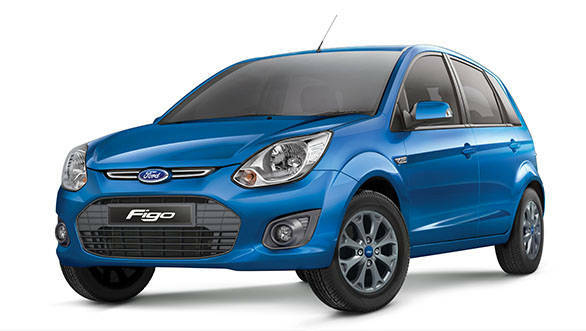 The new Ford Figo has grown slightly in proportion to the old car. It is taller and wider with the wheelbase increased by 2 mm. It is based on the Aspire's platform and that's good news considering the fact that the Aspire is a spacious car. The Figo Aspire and the new hatchback look exactly the same, from the front end right upto the C-pillar after which the hatchback shape follows. Ford have done a good job of ensuring that the car looks proportional. The headlamps and tail lamps are also similar to the sedan. Ford India have taken a commendable step by offering airbags in all variants with the top trim getting six airbags, a segment first. The new Ford Figo also gets the Aspire's goodies such as the Ford MyKey and Ford Sync with all link. While the former allows the owner to set the speed limit allowing parental control over kids whereas the latter allows you to pair your phone with the car's system to make or receive calls as well as run apps. 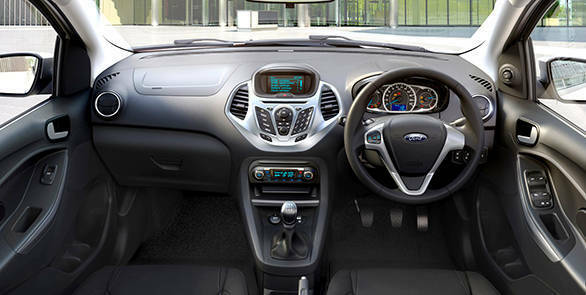 The interior is similar to the Aspire except for the all black theme that's in line with the first generation Figo. 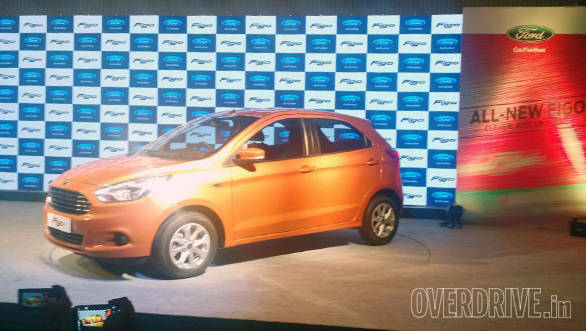 While Ford offered the earlier Figo with one petrol and one diesel engine, the new Ford Figo will come with a choice of two petrol units and one diesel motor, just like the Aspire. 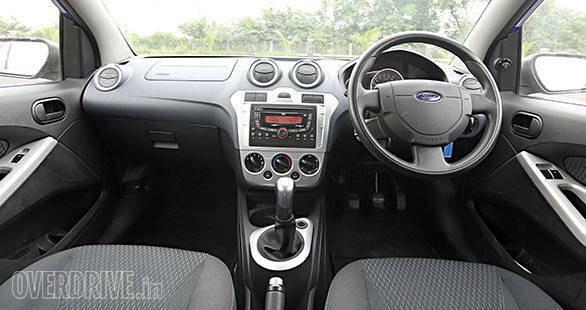 The 1.5-litre Ti-VCT, 100PS, petrol Ford Figo will come with a six-speed, dual clutch automatic transmission while the 1.2-litre Ti-VCT petrol and the 1.5-litre diesel will get 5-speed manuals. The driving dynamics of the new Ford Figo Aspire are class leading but sadly not similar to the old Figo. The electrically assisted steering is responsive when compared to its peers but it is no match for the hydraulically assisted steering in the old Figo. The old Figo was a genuine corner carver, with the sweet chassis offering immense confidence and feel. The hydraulically assisted steering was very communicative too and the little hatch soon found a place in the hearts of many enthusiasts. We haven't driven the new hatchback yet - stay tuned to OVERDRIVE to find out how the new Figo fares on the road.